Wishing you all a very happy Diwali, the festival of lights that brings with it a couple of more festivals, Dhanteras that preludes Diwali and then Bhai dooj and Govardhan pooja to follow. 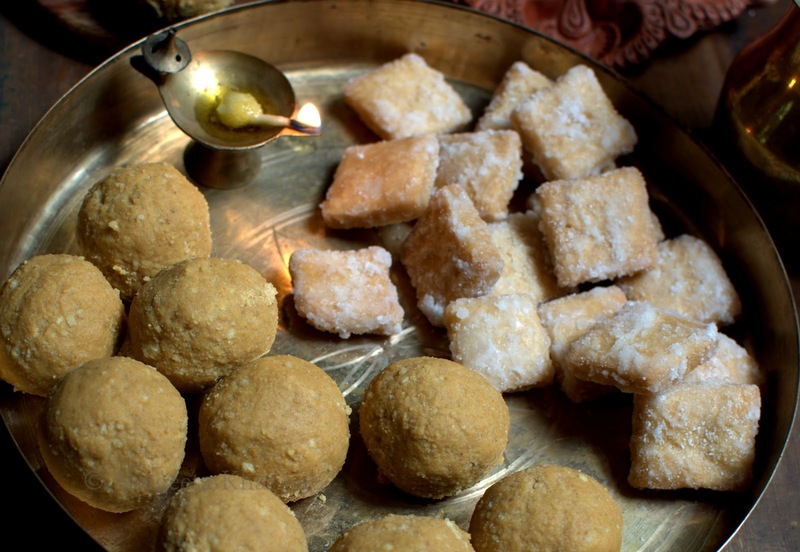 Several sweetmeats are made in Indian homes and there is a round of worshiping several Gods in this season. I am not a religious person but like to soak in the festive mood by cooking something that has been a family tradition. Lighting the diyas and candles, spring cleaning the house and spending time with loved ones as it is a national holiday too. Some memories of childhood are revived and some new are formed. We generally stay away from crackers and pompous gifting traditions associated with this festival, enjoying the home made sweetmeats and homegrown happiness is much more worth. 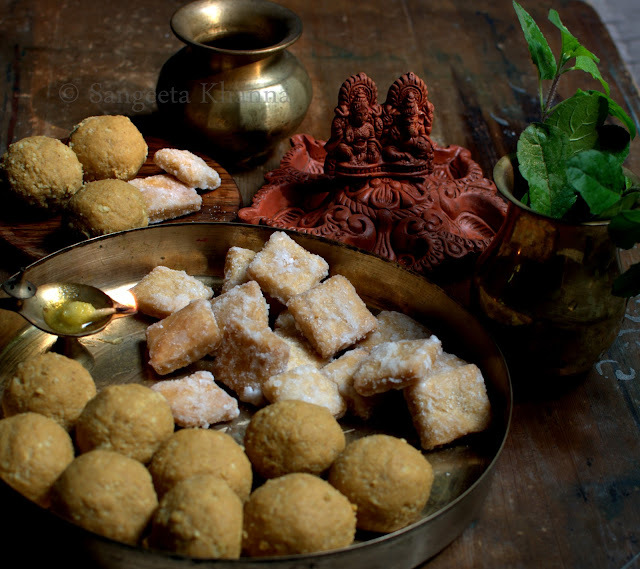 Besan ka laddoo and Shakkarparey are the two things my MIL used to make on the day of Dhanteras, for the bhog of the evening's pooja. Surprisingly, I normally forget to make these on that day as there is no internal clock in my system to remember festivals and associated pooja rituals. Yes, I remember the foods but then I need to get a clue when to start. So this year too when I was leaving for a friend's place the husband gently reminded to make Besan ke laddoo for the pooja that he would do in the night. Did I tell you he is the one who performs festive rituals quite well, I am the one who just watches the pooja being performed, enjoying the scents and chants. Talking of the scents and the chants, the Sankatmochan temple at Varanasi is one place if you love the scent of a temple. That ghee laden sweetmeats, a heavy waft of Tulsi leaves and some Ghee lamps burning, you are transported into a different world when you visit this place. The holy water that (Gangajal kept in a pot with Tulsi leaves in it,called Charanamrit) the Pandit offers has a distinct Tulsi taste and aroma that I can feel right now typing these lines. That was the reason I wanted some Tulsi leaves to be kept with these besan ke laddoo so the aroma gets infused in them. You are right, I am talking about he Sankatmochan waale besan ke laddoo. Those ghee laden laddoos with a crackling of crystalline sugar is kept in a palm leaf box along with Tulsi leaves and you get that taste of Tulsi when you have them reaching home. I learned the trick of making that crackling sugar from my MIL. My mother used to make the besan ke laddoo with simple powdered sugar and that was good but nothing extraordinary. That crystalline sugar that is called Boora in North India can be made at home within 15 minutes or so, depending on the quantity you want. The process is pictured step wise later. Heat ghee in a thick base kadhai and pour in the besan. Mix well and start roasting on low flame. The mixture looks crumbly in the beginning and goes on to become flowy. I took many pictures during the roasting process that took about 40 minutes, as the consistency and color of the besan went on changing. The aroma also changes and you would know when the besan is well roasted. See the pictures for more details, starting from the first to last..
After roasting the besan, start with making the syrup for making crystalline sugar. Since the sugar syrup needs to be whisked vigorously in the last lap, you would want your hands be free from roasting the besan at that time. I can handle both the things simultaneously as I have some practice, and I do switch off the besan side of the gas if required, you can do that too. So for making the crystalline sugar you start with sugar and just enough water to submerge the sugar. 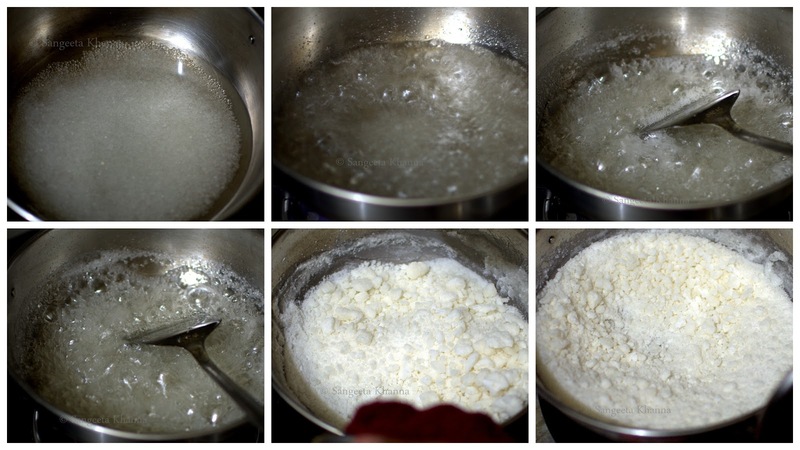 The first picture in this collage is taken after a couple of minutes of adding the water so you see more water than it was, the sugar already had started melting. It will be good to know that there is no strict quantity of water added, as it just take a couple of minutes more to get the right consistency if you add a little more water. The syrup first starts boiling, then frothing and when the frothing increases, and you see some sugar being crystallized on the sides of the pan, just take the pan off the flame and whisk vigorously with the help of a sturdy spatula (a wire whisk doesn't work as the sugar syrup starts resisting movements). You would notice after the fourth picture the sugar looks crystalline and white, a few steps in between are missing as whisking and clicking pictures is not possible simultaneously. In the missing steps, the sugar syrup looks like honey first and then starts getting opaque, that is the time it will start crystallizing too. Just keep stirring to make smaller crystals otherwise it would result in a huge chunk of white sugar. There will be some large crystals too, you might like to thrash them using a Pestle or just sieve the sugar so you get uniform sized sugar crystals. The large chunks can be used to sweeten anything you wish (I use them to make the syrup for shakkarparey, recipe next). The sugar is then mixed with the roasted besan mixture. The two are mixed well to combine well. 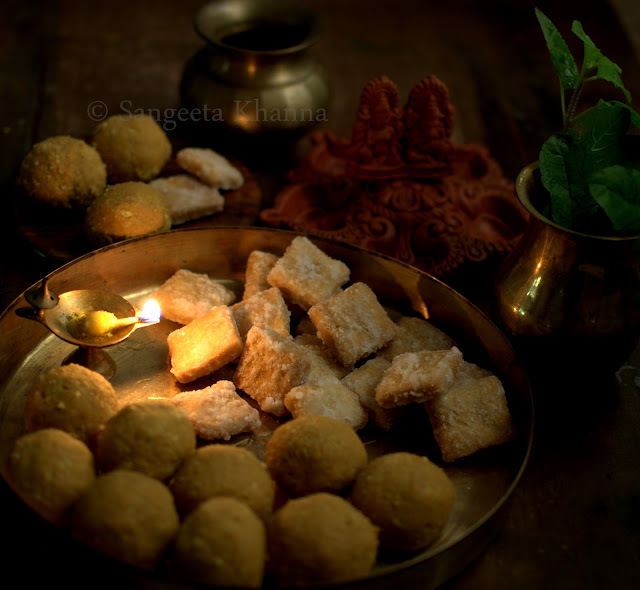 You can add some chopped nuts or cardamom etc, but they are not added in the Sankatmochan wale laddoo and you wont like to spoil the original taste if you are looking for that. The quantity of sugar can be tasted and adjusted at this step. Allow the mixture to cool down so you can handle them to shape balls. The laddoo gets solidified after some time in winters, owing to the presence of ghee. 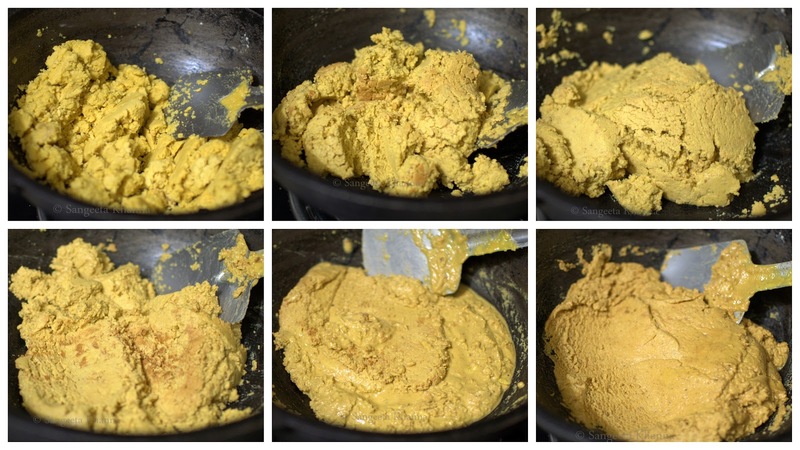 If you notice the mixture is too cold and does not bind well to form laddoo, you can heat the mixture on gas or in microwave so the ghee melts again to allow binding of laddoo well. The large sugar crystals are visible in this picture. They provide a nice texture and the taste of the laddoo is transformed owing to this. Did I tell you I made this laddoo and Shakkarparey at 8 Pm that day? That was after I returned from my friends place. I kneaded the dough for shakkarparey when the laddoo mixture was cooling down and used the same leftover sugar in the pan to make the syrup for shakkarparey too. 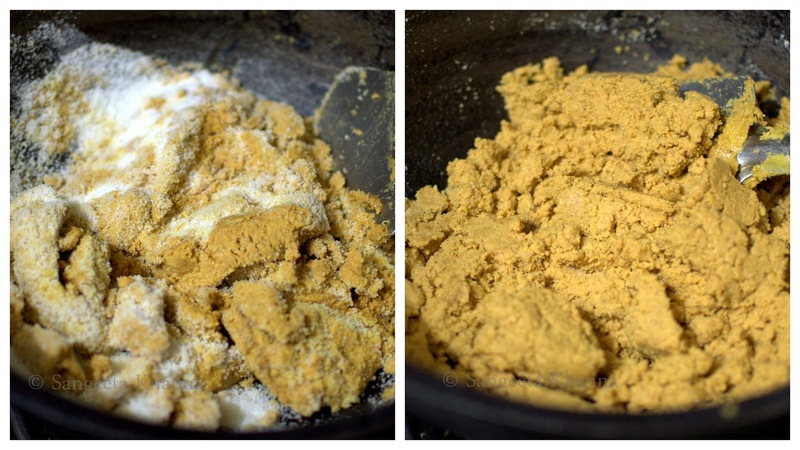 Rub the shortening part of ghee into the dry flour till it resembled bread crumbs and then add the fennel seeds and water to knead a firm and strong dough. Roll out the dough into a half centimeter thick circular roti and cut squares using a sharp knife. The squares can be like cookies or biscuits, any size you prefer. Deep fry all of them in batches till they are pinkish brown and crisp. Low flame is helpful in making them crisp and cooked through. Now add water to the sugar just like we made the sugar syrup in the laddoo recipe. I just added some more sugar and water to the same pan with leftover large chunks of sugar and proceeded to cook the syrup. The same kind of frothing happens again and you can keep a bowl of cold water to check if the syrup is ready to crystallize Just drop a tsp of syrup in the bowl of water, if the syrup immediately looks like a glass coin it is ready for coating the shakkarparey (Or crystallizing as required for the laddoo). So as soon as you get the indication that the syrup is ready, tip in all the fried shakkarparey squares into the syrup and start stirring and mixing them quickly. The syrup will coat the squares and then become white in color. A uniform coating of sugar will be there on each of the fried square. These are like glazed cookies. Let them cool and store in an airtight container. Discard the remaining sugar or use it for sweetening anything else if you have a large quantity left. I cooked a few more sweetmeats for diwali. There was some Gujhia made at my friends place. It was an opportunity to bond with her kids and see the contented happy smile when they eat a freshly fried Gujhia. I also made a raisin, almond and date syrup Sondesh on the day of Diwali. Will post the recipe very soon. Wishing you all a great time, good food and family bonding this festive season. There was silence on my blogs as I was away for a vacation in the mountains. We visited Gangtok and Darjeeling before Diwali and brought back great food memories. Those will be shared soon here on the blog. Loads of pictures and food storied to be shared with you all. Stay tuned. Sangeeta, Happy diwali to you and your family. I made besan laddoos too, but with regular chini. I absolutely have to try this recipe next time. Another bookmark from your excellent website for me. :)And your pictures are stunning! My husband talks a lot about the Sankatmochan temple---a favorite spot from his days when he was a student at BHU. Waiting for your posts from Gangtok and Darjeeling.... love the cuisine! Sangeeta, I was trying to make magdal..another typical sweet from Varanasi. It has been years that I had them there and got a little confused about the garnish...as far as my memory goes it was pistachios and elaichi..do you have any suggestions? I think you could post a recipe here.. 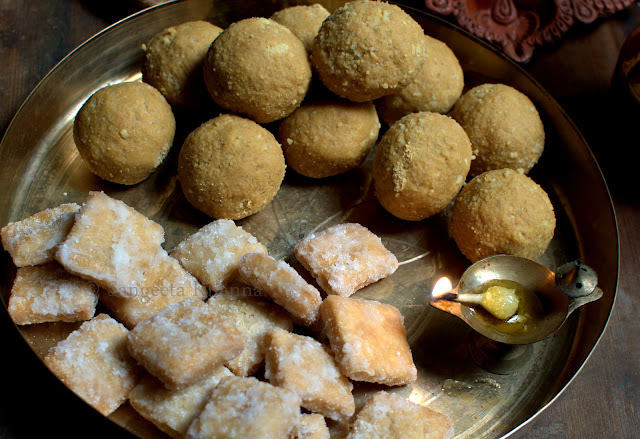 Thank you, I am trying to make them keeping the mung flour, ghee and sugar ratio similar to this laddoo but I personally feel it has a little more ghee in it..in fact tried a very small batch and could whip to cream color...but concerned about amount of ghee...waiting for your recipe..thanks in advance.